Wow, your every wish taken care of and much much more. 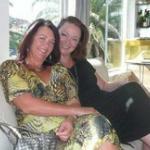 Do yourself a huge favour, get some family or friends together, stay at this truely amazing villa and enjoy. 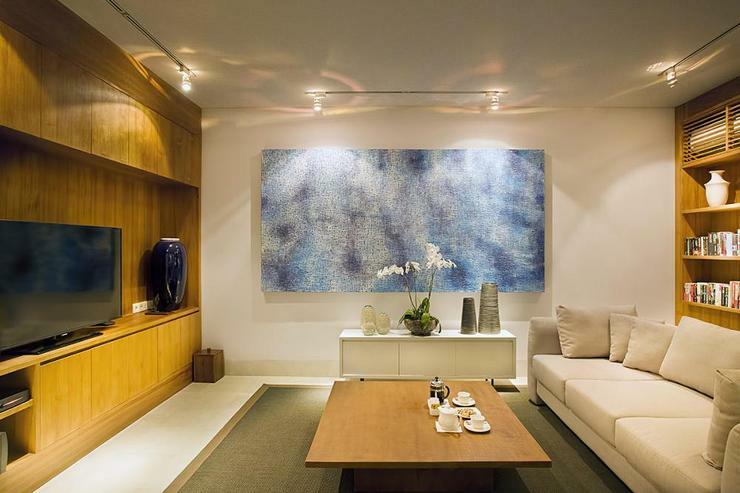 Mind blowing artwork from Smart Art Indonesia as well as beautifully apointed rooms. Best holiday you will ever have, Pak Dudu the house manager and his talented team deliver on your every dream. 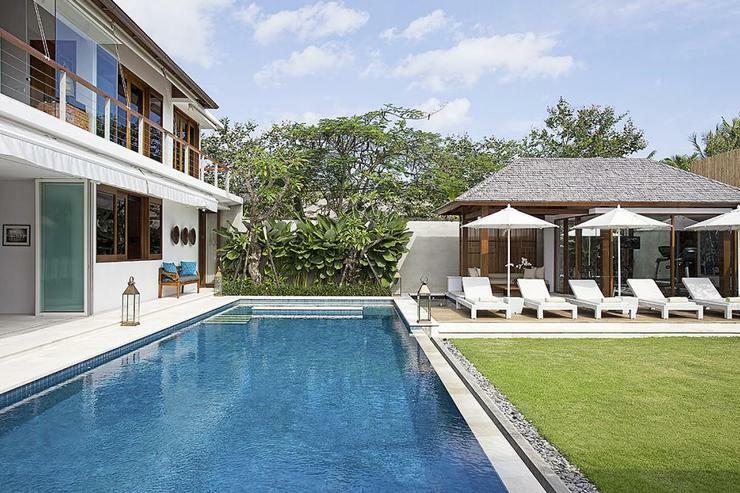 We chose this villa for the spacious layout and the well appointed bedrooms. 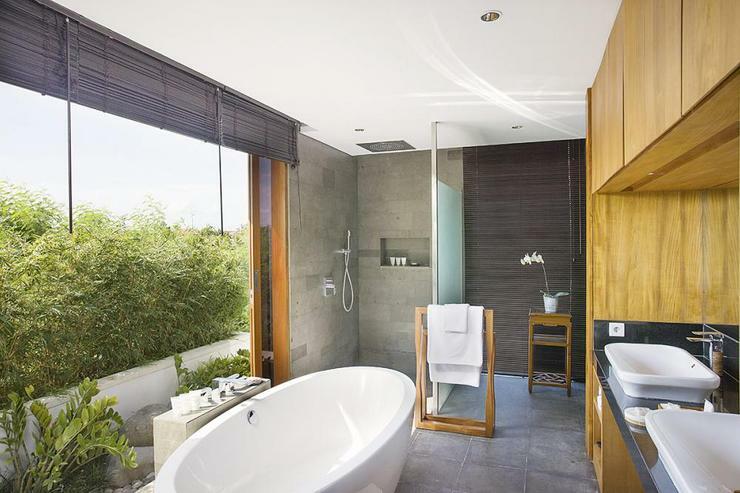 Each bedroom is top class with flexible bedding options and gorgeous bathrooms. The staff were outstanding and went out of their way to ensure our stay was perfect. The breakfast food/choice was great...and we enjoyed lunch by the beautiful pool on several occasions. So close to all the top restaurants which we used the villa driver for each night. 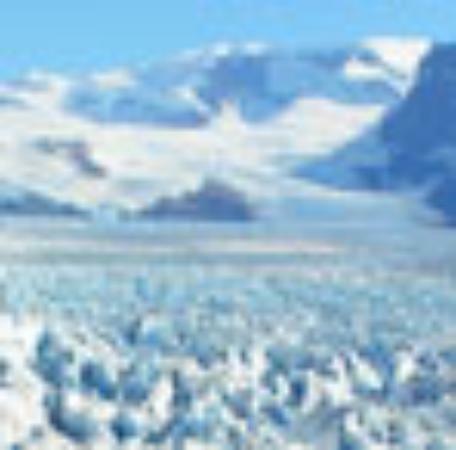 Location is great if you want to be close to the beach. You could walk to Jl Petitenget for the favourites such as Amo Spa, Biku, Merah Puti etc but probably too far for most. Best to use the driver for this. 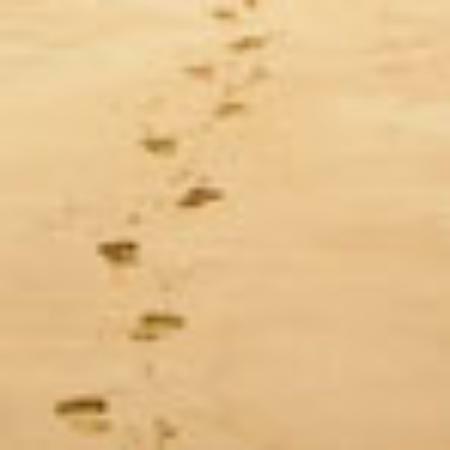 Access to Potato Head is just a stroll down the beach however! We will definitely be back..hard to beat! #villalife at it's best ! 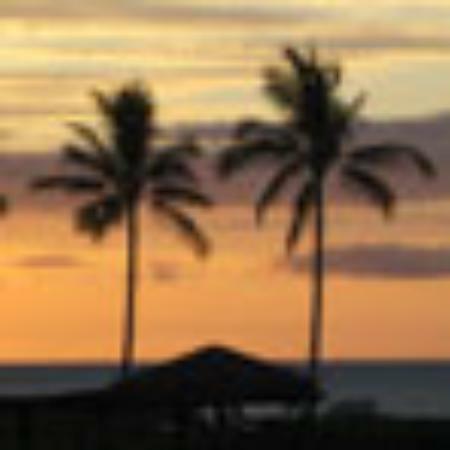 "Very Cool Condo with good location and friendly people"
The villa location is close to the beach. They have very clean pool. Breakfast menu is variation, complete with fresh cutting fruits. This is a great condo for family. Their staffs have a good hospitality and informative. They help us to know some places in Bali. We satisfied to stay here and we'll visit again next time. Thank you. 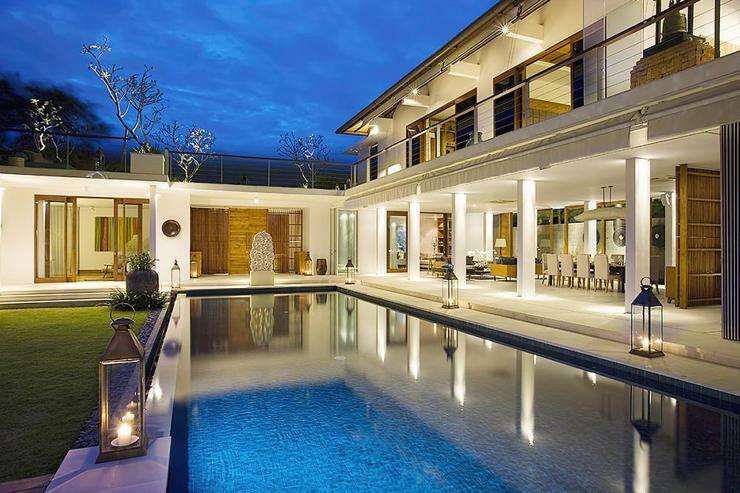 We loved everything about this Villa. Not only is it stunning but the staff make it even better. A big shout out to Dudu & the team who made our stay a wonderful! Nothing was too much trouble. The Villa itself is in a great location. 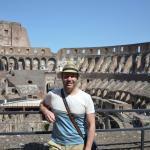 Walking distance to the beach (Under 2 mins) & also into the main square (10-15 mins). But far enough out of the action to unwind Bali style. The pool - deluxe. The rooms very spacious. Great for 2 families or groups. Not to mention a fabulous sunset deck! We can't wait to go back! 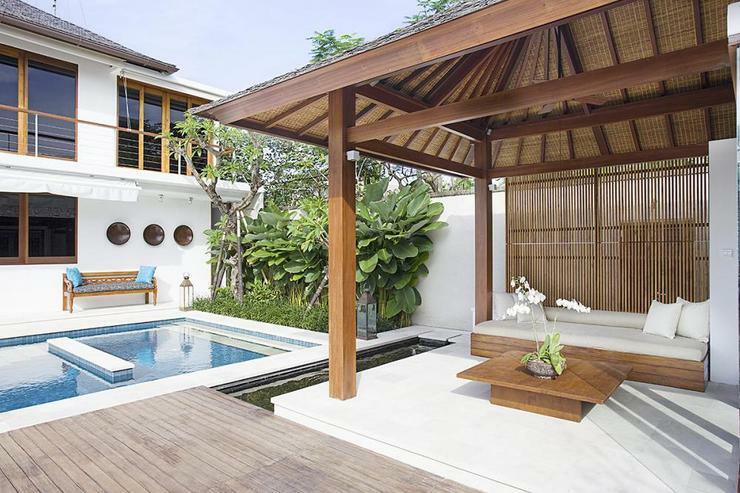 Villa Cendrawasih is conveniently and peacefully located at the end of a lane between Batubelig Beach (300m) and the popular shopping/dining district of Petitenget (900m). 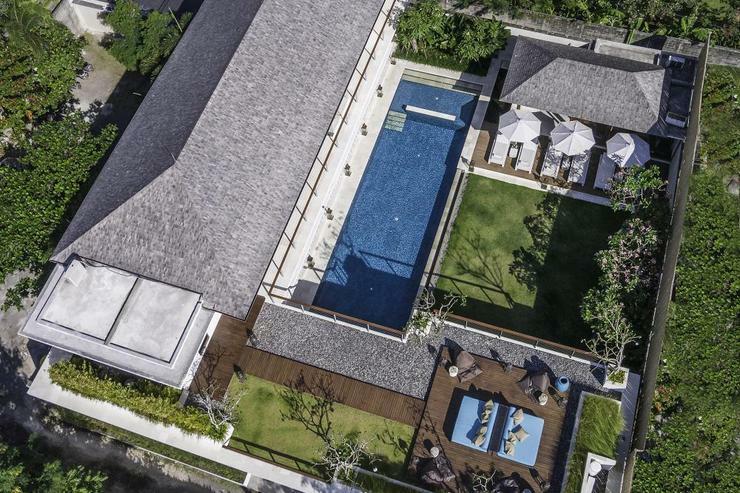 Although the villa enjoys a serene and partly rural setting it is within convenient distance of several restaurants, bars and boutiques within a two-kilometre radius. * Exclusive use of the villa booked and use of the services of it's staff team, including villa manager, housekeepers, personal chef and night time security. 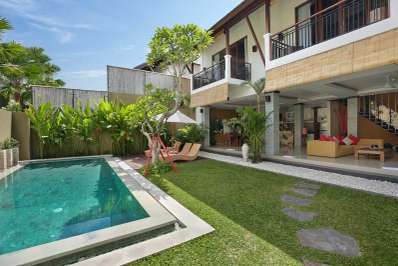 * All villa facilities, including private swimming pool and unlimited WiFi internet. * Complimentary car and driver for 8 hours a day(excluding petrol). 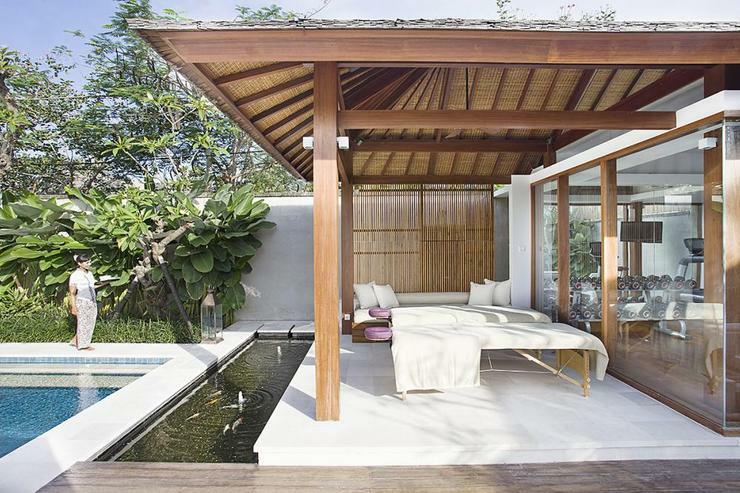 Enjoying a fabulous location, within a stone's throw of a sandy beach, Villa Cendrawasih has a stylish modern design. 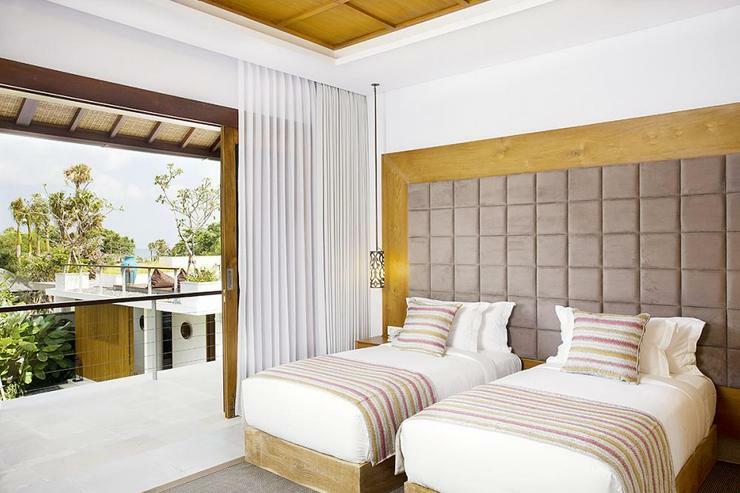 It has five fabulous bedrooms, an 18-metre swimming pool, well-equipped gym and charming sun terrace, making it well suited for family holidays, or groups of friends looking to let down their hair in tropical surroundings. 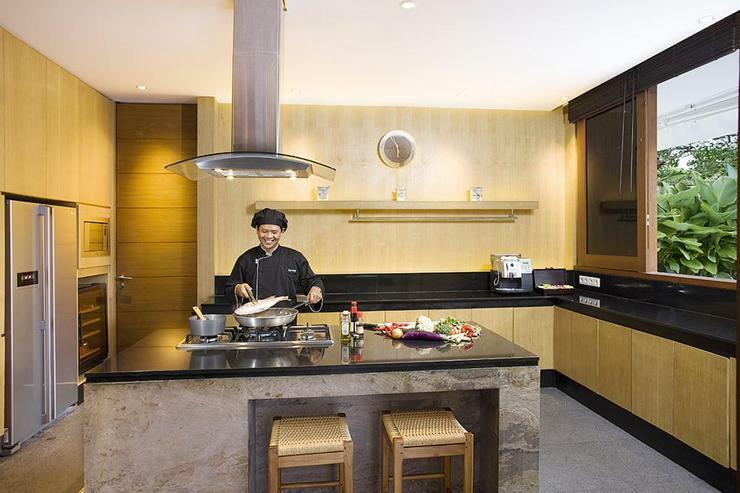 The residence is serviced by an attentive staff including attentive butlers who will cater to every whim, a professional chef to prepare gourmet meals, and a complimentary car and driver. 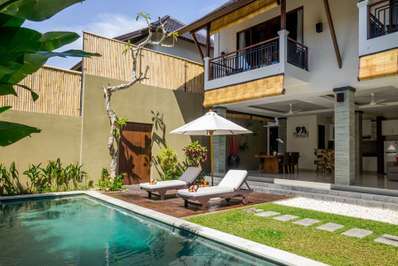 All the five bedrooms of Villa Cendrawasih are contemporary-styled bedrooms and are fitted with air conditioning, glass doors, and satellite-channel TV/DVD player. 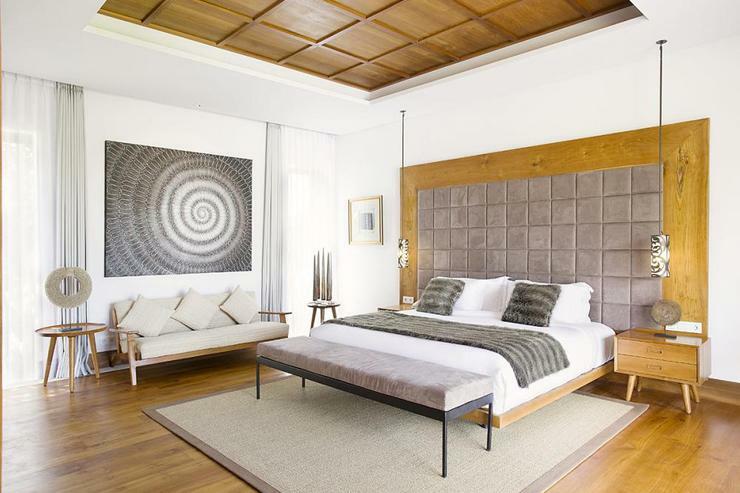 Located on the top floor, the master bedroom provides direct access to the roof terrace. 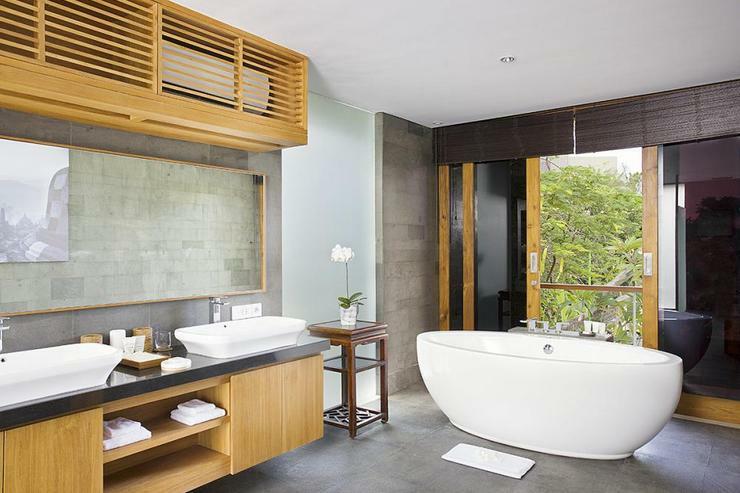 It has an ensuite bathroom with large walk-in rain shower and a freestanding bathtub. The two upstairs guest bedrooms are also furnished with king-size beds and have ensuite bathrooms with large walk-in rain shower. 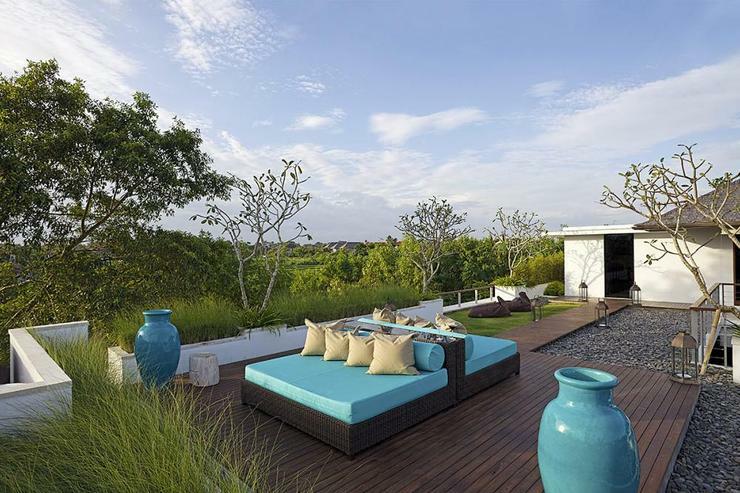 The fourth guest bedroom is on the ground floor and has a private sitting area on its terrace. The TV room on the ground floor converts to a fifth ensuite bedroom. 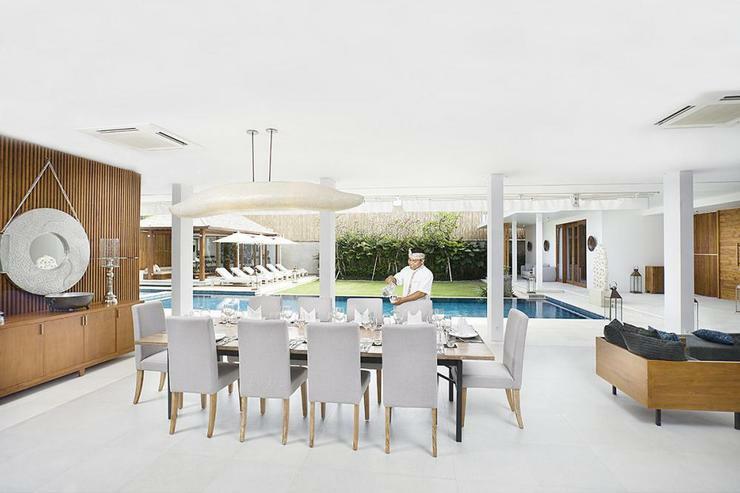 The air-conditioned living and dining area of Villa Cendrawasih provide a semi-outdoor living experience and instant access to the pool. 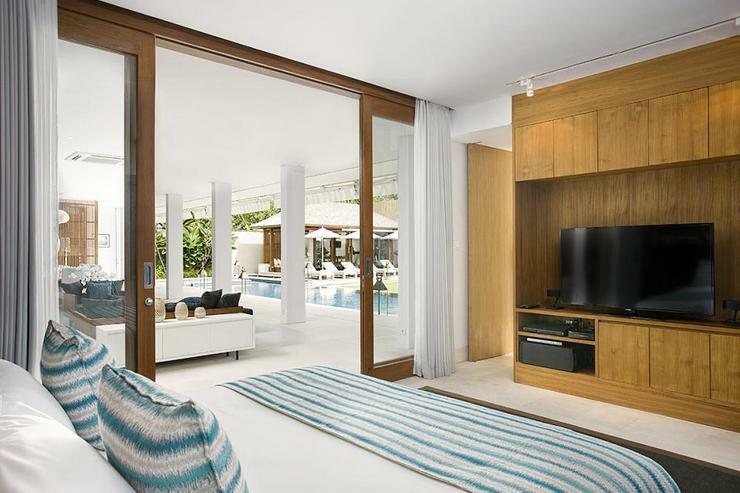 The living area is furnished with teak sofas and chairs set around a square coffee table while an iPod, dock and Bose speakers provide entertainment. The kitchen is separated by glass doors from the dining room. 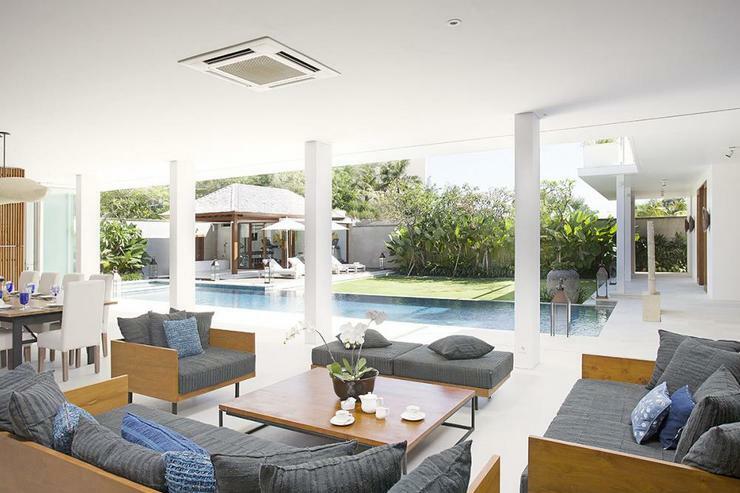 Separating the living room and garden is the pool and sun deck lined with six loungers shaded by sunbrellas. 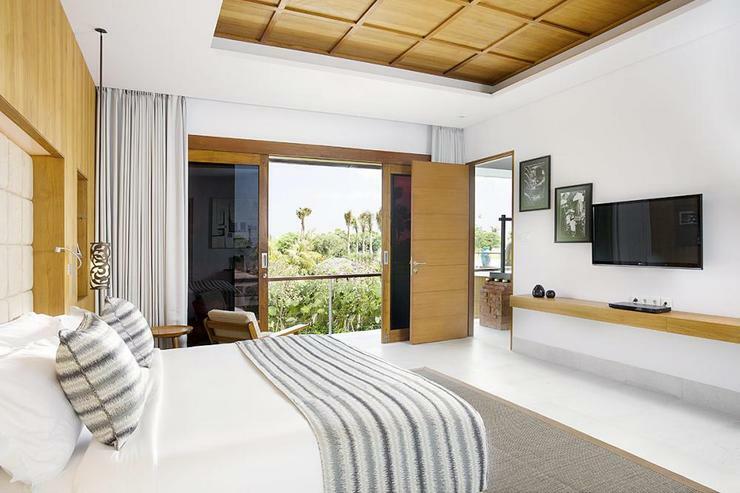 At the top of the stairs is a mini bar and a shady veranda leading to the spacious roof terrace with expansive views of the coconut palms, volcanoes and the sea. 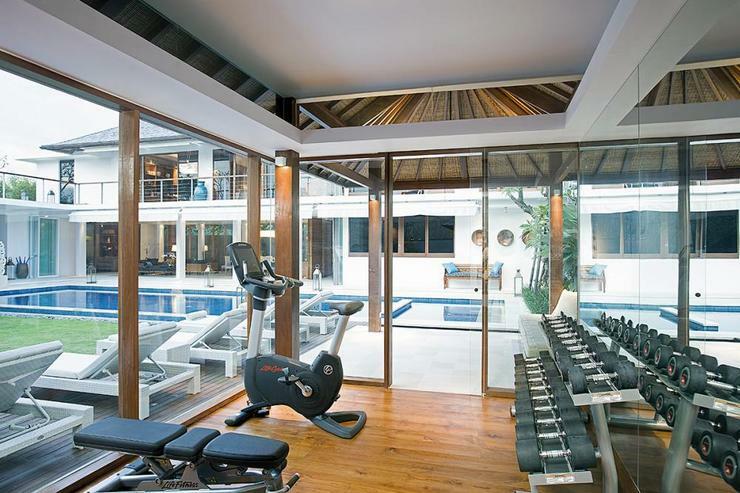 The villa also has a gym in a glassed pavilion in the garden.